Located in the heart of Namhaean, or the south coast of the Korean Peninsula, the city of Yeosu in Jeollanam-do (South Jeolla Province) is known for its clean and beautiful water. The name of the city comes from two words:yeo, meaning beauty, and su, meaning water. 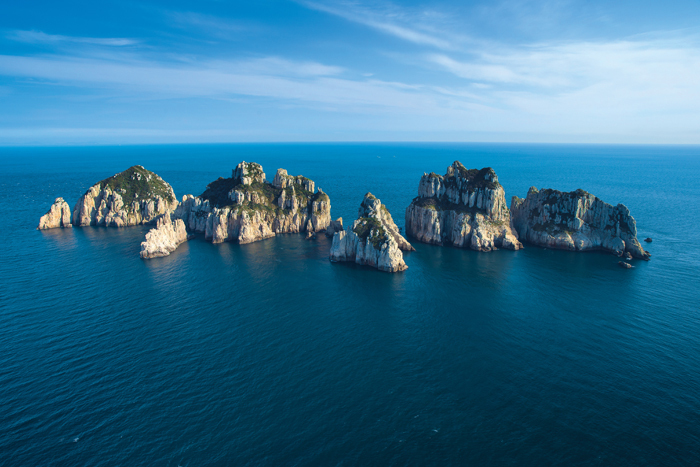 Beyond Yeosu city proper, the ocean is home to 365 small islands clustered and scattered along the nearly 880-kilometer coastline of Jeollanam-do. Being a beautiful sea port, Yeosu has long been a favorite destination for vacations. The breathtaking views offered by the open, clear sea, all painted in indigo, came under the international spotlight when the city hosted Expo 2012 Yeosu Korea two years ago. Recently, the city of Yeosu has published a collection of photographs to share its glorious landscape with the wider population. Yeosu itself is enclosed by water and the 365 islands surrounding the city are both inhabited and uninhabited. They are dotted across a wide area of ocean that resembles the bright blue sky it reflects. Nature’s colors are as beautiful as if indigo paint were spread across the sea. There are a wide variety of island shapes, from Dolsando Island, with an area of 70 square kilometers, to the tiny Soreukdo Island that is only about 0.02 square kilometers. 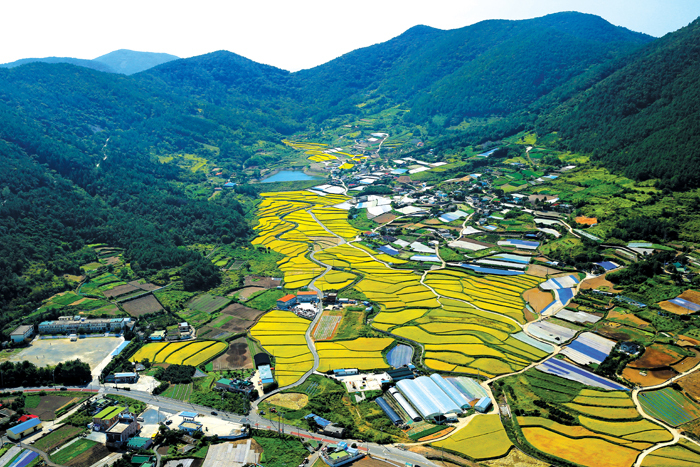 Among them are the most beautiful—Geomundo Island and the Upper and Lower Baekdo Islands—located alone, miles away from the archipelago, halfway to Jejudo Island. 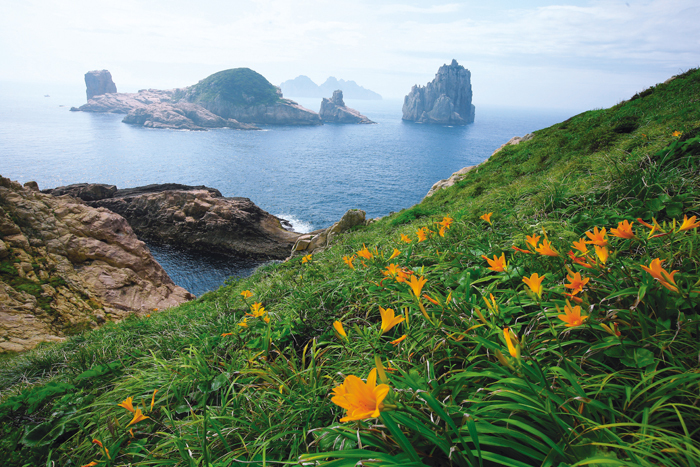 A day lily begins to bloom on one of the Baekdo Islands. About 28 kilometers east of Geomundo Island sits the mysterious collection of Upper and Lower Baekdo Islands. Comprised of 39 rock formations of all different sizes and shapes, organized into two clusters, the uninhabited islands remain naturally intact, with near-pristine environments and landscapes. Access to the islets is strictly limited, as they have been registered as a National Scenic Spot. The rocks are home to a variety of wild flora and fauna rarely seen elsewhere in the peninsula, including 400 species of subtropical plant, such as camellias, silver magnolias and day lilies, as well as the endangered wood pigeon and the fairy pitta, a small passerine bird. The Baekdo Islands consist of two separate groups: the upper Sangbaekdo and the lower Habaekdo. A ferry plies between the two groups of islets, following a course between the rocks, the only way tourists can travel to the mid-ocean spot. The trip offers a stunning view of the wide variety of rock formations and rock cliffs, weathered and shaped by the passage of time. Legend has it that the Jade King sent his son to Baekdo Island, but his child, as well as all of his loyal followers who went with him, never wanted to return. Each rock formation is associated with an interesting tale and legend that has been handed down over the generations. A view of the lower Habaekdo cluster of the Baekdo Islands. There is another famous island situated only a kilometer to the southeast from Yeosu city center. It is Odongdo Island, connected to the mainland by a 780-meter causeway. The tiny island covers only 0.5 square kilometers and yet is home to at least 200 types of tree. The most popular plant on the island is the red camellia. The camellias of Yeosu, compared to ones from other regions, have larger flower petals and are grown in denser clusters. Their vivid color contrasts between red flower buds and yellow pollen leaves, giving visitors a strong impression. The camellia begins to bloom in late autumn, in October, and fully blooms the following March. When they are in season, the whole island is covered with camellias. The “island of camellias” is visited by more than 500,000 tourists every year. Odongdo Island is famous for its camellias and wild life. 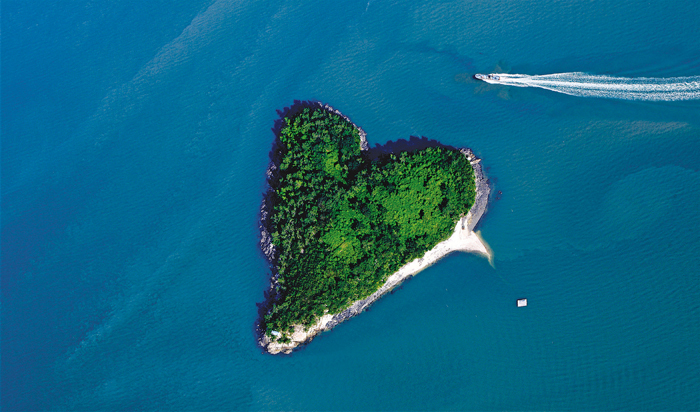 Mogaedo Island resembles a heart when viewed from the air. Geumodo Island is the second largest island in Yeosu, after Dolsando Island. Besides these popular islands, Yeosu is surrounded by a variety of other islands, including Janggundo Island, Yado Island, Sado Island, Chudo Island, Geumodo Island and Mogaedo Island, the last looking like a heart when viewed from above. 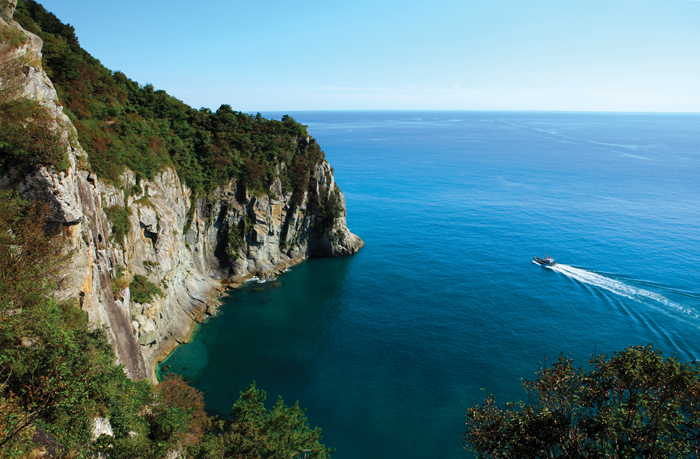 The book of Yeosu photos introduces the city’s travel destinations, putting them into five categories: the Islands, Light, Scenery, Festivals and Life. It includes scenes of a romantic nightscape that are reminiscent of the lyrics from “Yeosu Night Sea,” sung by Busker Busker. The book also introduces local festivals and the nearby peaceful villages. The peaceful village of Dunjeon is located on Dolsando Island. The photo collection offers translations into four languages: Korean, English, Japanese and Simplified Chinese.